You're driving home from work one day when the car owner's worst nightmare happens: the check engine light pops on. It comes without warning and with no explanation. For most drivers, this means a trip to the mechanic, but it's not difficult to diagnose (and sometimes fix) yourself. 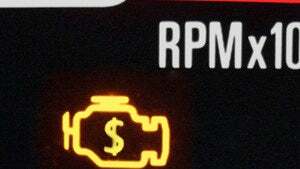 As Jalopnik recently pointed out, the check engine light is one of the most frustrating and confusing facets of owning a vehicle. It's just a light with no information telling you what the problem is. It's a cry from a baby with no explanation. But you can do a few things yourself before heading into the shop for costly repairs. Unless your car starts smoking or stalls completely head over to an auto parts store and have them run a diagnostic to find the cause of the check engine light. Call ahead and make sure they can handle your make and model, since some cars have special computers. Once you're at the store, they'll come out and plug a small computer underneath your dashboard and read back a code stating what happened to the car. According study conducted by CarMD, five common malfunctions cause the check engine light to come on, and several of them are simple to fix yourself. Let's take a look at the most common issues. An oxygen sensor is a part that monitors the unburned oxygen from the exhaust. It helps monitor how much fuel is burned. A faulty sensor means it's not providing the right data to the computer and causes a decrease in gas mileage. Most cars have between two and four oxygen sensors and the code you get from the scanner will tell you which one needs replacing. What causes it: Over time, the sensor gets covered in oil ash and it reduces the sensors ability to change the oxygen and fuel mixture. A faulty sensor not only reduces gas mileage, it also increase emissions. What you should do: Not replacing a broken oxygen sensor can eventually lead to a busted catalytic convertor which can cost upwards of $2,000. Taking your car into a shop will cost you around $200 depending on the car. However, an oxygen sensor is easy to replace on many cars and is usually detailed in the owner's manual. If you know where the sensor is, you only have to unclip the old sensor and replace it with a new one. Regardless of how you approach it, you should get this fixed right away. You wouldn't think a gas cap would be that important, but it is. When it's loose or cracked, fuel vapors leak out and can throw the whole fuel system off. This causes a reduction in gas mileage and increases emissions. What causes it: If you get an error pointing to the gas cap it means fuel vapors are leaking out of your cap. This means the cap is either cracked or just wasn't tightened well enough. What you should do: If your car isn't feeling jerky or strange when the check engine light comes on the first you should check is the gas cap. Pull over, retighten it, and take a look at the cap to see if it has any cracks in it. Continue driving and see if the check engine light turns off. Alternately, you can purchase a gas cap for about $3 at an auto parts store. All you need to do is take the old one off and screw on the new one. If you've already made it to the store, you might as well just replace it. While not car-threatening, it's good to take care of this right away to improve gas mileage. The catalytic convertor works to reduce exhaust gases. It converts carbon monoxide and other harmful materials into harmless compounds. If your catalytic convertor is failing, you'll notice a decrease in gas mileage or your car won't go any faster when you push the gas. What causes it: Catalytic convertors shouldn't fail if you're keeping up on regular maintenance. The main cause of failure is related to other items on this list, including a broken oxygen sensor or deteriorated spark plugs (we'll get to those in a second). When it fails, it stops converting carbon monoxide into less harmful emissions. What you should do: If your catalytic convertor fails completely, you eventually won't be able to keep the car running. Your gas mileage will also be terrible, so you should try and fix it as soon as you can. Unfortunately, the average replacement cost is around $2,000 and you can't do it yourself unless you're an experienced mechanic. The mass airflow sensor tells the car's computer to add the proper amount of fuel based on the air coming through to the engine. A faulty one can increase emissions, cause the car to stall, and decrease gas mileage. What causes it: Most mass airflow sensors fail because of a improperly installed (or never replaced) air filter. You should replace the air filter at least once a year to help prevent the airflow sensor from failing. What you should do: Theoretically you can drive for a few weeks or even months with a broken MAF sensor. You will notice a decrease in gas mileage and over time the car will eventually start stalling a lot. At a shop, the replacement cost is between $200-$300 depending on the car, but that's usually the cost of parts because the labor is relatively simple. It's not terribly difficult to do on your own, but the process is quick enough you may want to let a mechanic handle the project in case the sensor doesn't end up being the issue. The spark plug seals the combustion chamber and provides a gab for a spark to jump across and initiates combustion in your engine. When the plugs are failing, the spark plugs misfire. You'll feel a little jolt in your car's acceleration when this happens. What causes it: Most spark plugs in cars from before 1996 should be replaced every 25,000-30,000 miles. Newer ones can last up to 100,000 miles. Still, plugs fail over time and there's not much you can do about it. What you should do: Get them replaced right away. It's easy and cheap and your car will run better for it. If your spark plugs fail and you've made your way to the auto parts store, you can replace them easily following the video above. Since this is part of your vehicles regular maintenance, the spark plugs are usually easily accessible from the hood of the car. It's simple enough that I've seen people doing this in the auto parts parking lot on several occasions. Plenty of other possibilities for a check engine light are out there, but the above five are the most common. How long do you usually let the check engine light stay on before you do something about it?